Veritas Tactical makes AR pistols for self-defense applications. For those who know me and have trained with me as well, it is no secret I am a huge advocate of the AR pistol. There are many reasons, which I shall address in this article. 1934 established a law forbidding the possession of a rifle or shotgun under the barrel length of 16 inches, which the Bureau of Alcohol, Tobacco and Firearms would classify as a short barrel rifle. Of course, a law-abiding citizen could apply for the tax stamp at a cost of $200, plus the jackedup price for their choice of an SBR, which can easily go from $2,000 to $3,000 or more, with a wait for the feds to approve your paperwork for a year or more. Or one can simply buy an approved AR pistol with an approved SIG brace, Shockwave blade, Lawman Tactical or some other approved variant stock that the BATF allows, even for shoulder firing positions. All for half the cost of an approved SBR. Considering the outrage against semiautomatic rifles in the news lately, some might question the sanity of a recommendation for the AR platform. Let me explain. 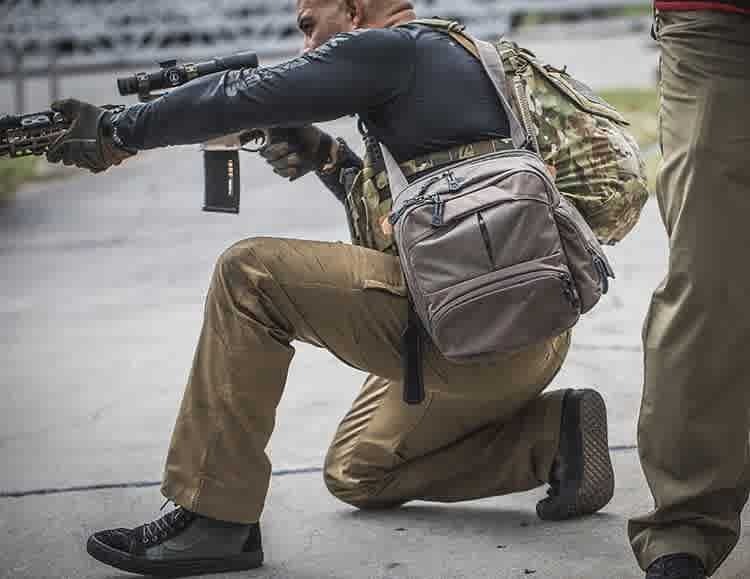 Alex Ferrer (right), Veritas CEO and owner, and Fernando “Zep” Zeppieri, the company’s sales manager, have years of tactical experience with law enforcement and personal protection for the CIA and others. FIRST, FROM THE historical side of it. The group of people I put as the best ever overall citizens in the United States who used guns in their daily lives were the pioneers of the 1800s traveling west in covered wagons and building homes in the open prairie. It was not uncommon for them to have the newest weaponry of some kind of single-action sixshooter like a Colt, a double-barreled shotgun (usually under 16 inches for concealability) and the most popular assault rifle of the day, the Winchester lever-action. And every man, woman and child knew how to safely use those weapons with great proficiency. Why? Because those weapons provided food on the table and protection from hostiles and marauders. So what has changed between the hostiles and marauders of yesterday and those of today? Nothing much, except for the fact that the evil men of today are getting more violent and more aggressive, preying on victims who are helpless against them, because some social bureaucrats who are well protected from violence themselves with armed guards see fit to restrict the very guns that would help the common citizen household. The AR platform is also ideal for self-defense. For the legally armed citizen, the two most common areas of vulnerability, not surprisingly, are the home and the vehicle. could have to fortify their defensive positions in the places most likely to get attacked. This may not be a politically correct statement, as the anti-crowd denounces the use of the AR rifle for any reason, especially making the case that most mass murder active shooters used these types of weapons. A rational human being will cite that evil people will use whatever implement they want to murder someone. However, consider the damage and destruction someone who had very little to no training on the AR system and how effective it was. RECENTLY I ATTENDED a training session with two of the heroes from Benghazi and 13 Hours fame. Kris “Tanto” Paronto and Dave “Boon” Benton were the instructors of this two-day course. What caught my eye was the AR pistol that Benton was shooting. He explained to me that it was built by Veritas Tactical. When I further pressed if that was one of the men in the handgun portion of the class, I learned that indeed it was – one Fernando “Zep” Zeppieri. 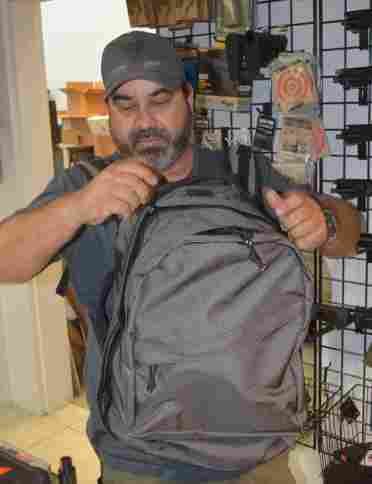 Zep is not only the sales manager for Veritas Tactical but also a gunsmith and firearms trainer. Now I was even more intrigued. personal stamp of approval, one should pay attention, and I did just that. me the green light to spotlight Veritas Tactical and their AR pistol platform. VERITAS IS OWNED and operated by Alex Ferrer, who is cut from the same mold as Benton. 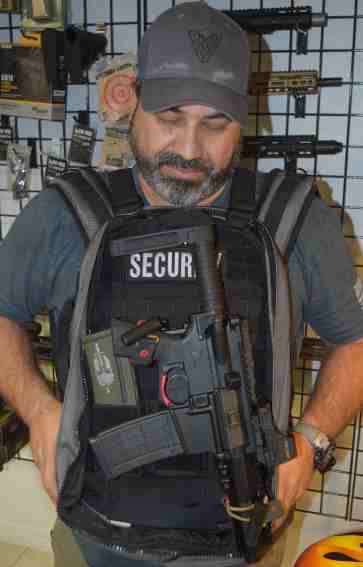 Ferrer has over 19 years of tactical experience in law enforcement and 12 years of private security and intelligence, working for very high-speed people. aforementioned sales manager, has an equally impressive LEO background. He has had experience in everything from patrol to criminal investigation division working in the narcotics section/street and investigation. In plain English, these men are seasoned door-kickers. Men who have taken down bad guys and slugged it out with them in gunfights. they build work each and every time. have learned life lessons, learned the hard way, and they’re still standing, which speaks volumes! finest American machined parts. 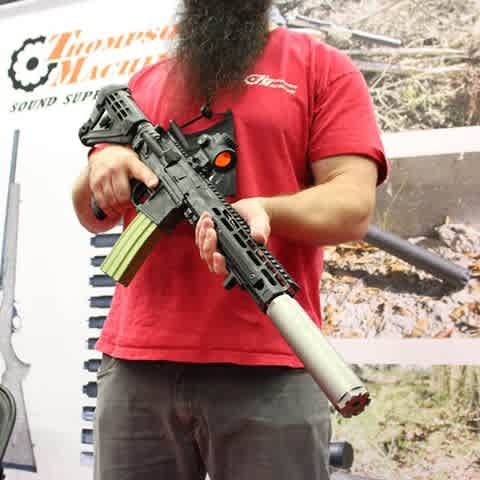 This led to an interest in shorter AR guns, even an AR with a 10.5-inch barrel working in conjunction with Artisan Arms out of Apopka, Florida, for gun barrels Veritas Tactical could work their magic around. As they say in the business, the rest is history. that was still chambered in 5.56mm or .300 Blackout and the most important element to make the gun work! 4.5-or 5-inch barrel in 5.56mm or .300 Blackout. The Veritas Pro or Pro Elite Series SBR/Pistol weapon systems are available with 7.5-, 10.5-and 11.5-inch barrels chambered in the same calibers. Using the same barrels in all of Veritas’ weapons gives working consistency and a great performing barrel in all lengths. The weapon system from Veritas that had me salivating the most was their VT15 Pro Elite 7P AR-Pistol. Being true experts, it would have been very easy for them just to go on their own personal experiences to build their guns, only they didn’t. features on the Pro Elite Series. ammunition from their 14.5-inch barrels (which is incredible). To document just how good the Veritas guns are, a sheriff’s department in Florida conducted a ballistic test using multiple bonded and duty rounds. The rounds were fired out of the Pro 7.5 and it performed very well, and on a few of the tests it had better penetration results than other 10.5-inch and even 16-inch rifles that were being tested by the sheriff’s department. THE AR PISTOL is a great self-defense platform, as it is portable to conceal and transport. If things go bad, a lot of rounds can go downrange with pinpoint accuracy to make the threat go away quickly. A good quality semiautomatic pistol like a Glock 17, a good pump shotgun like the Remington 870, and a good AR pistol from Veritas Tactical. Much to the chagrin of my girlfriend, I will heed my own advice as the Veritas Tactical VT15 Pro Elite is the next gun that will be a warm welcome with the rest of my inventory. 􀂐 Editor’s note: For more information, go to veritastactical.com.